The evening was billed as a listening party, but the friends and collaborators of Aaron Alexander received a full-on performance Friday night in the Crossroads district. Less than 24 hours before things got kicked off, KCK rapper Aaron Alexander had released his debut album, "Memento Mori." He decided to perform it in its entirety for the two dozen folks that attended this business casual, invite-only event. 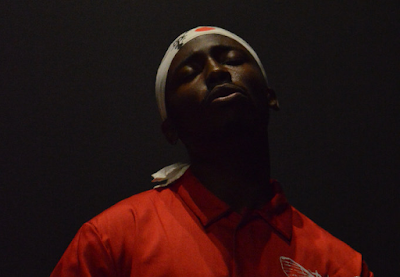 Outfitted in a custom red jumpsuit and a hachimaki headband, Aaron Alexander performed for forty minutes and was briefly joined by jazz ensemble Stranded In The City. Alexander occasionally employed a prop telephone for the moments on "Memento Mori" that involved phone calls with the character Father Time. The simplicity, intimacy, and attention to detail displayed assured that it will not be an evening soon forgotten.